I thank William Shaheen for finding this misprint. This bug has not been fixed in D5300 firmware 1.01, 1.02, or 1.03. Manual Movie Settings still needs to be turned off when you are doing still photography with Live View. Note however that Nikon AF-P lenses cannot be focused (even manually) when not connected to a Nikon body, so this adapter is not useful with them. change as well as Windows. to: and can be bridged to ASCOM under Windows. change On subsequent runs, it uses the master frame to save time. to: On subsequent runs, you can select the master frames rather than the whole set of calibration frames, to save time. to: " in 6 places. We are of course talking about arc-seconds, not arc-minutes. This is a technical problem with the typesetting, as you can see from the fact that there is extra space after the marks. There is no dark frame other that the flat dark already mentioned. to: m" in table headings where it is not already in italics. shopping strategy should be indented 2 levels, to line up under manufacturer. (pp. 11-12) Electronic First-curtain Shutter (EFCS): I have verified that even the Canon EOS XS (1000D), a low-end camera, has EFCS when pictures are taken in Live View. The availability of EFCS on low-end models is a Canon selling point. (p. 13) Shopping Strategy: Don't overlook the possibility of renting high-end lenses, cameras, and even hydrogen-alpha or infrared modified cameras. Two reliable companies that offer all these things are www.borrowlenses.com and lensrentals.com. Rented equipment is often available for purchase, so this can be a painless way to try before you buy. (p. 16) Transferring files from one computer to another: One method I use is to copy them to a 32-GB SD card. However, the default file system (FAT32) will not accommodate files larger than 4 GB, so you must format the card as exFAT or NTFS instead (which also makes it faster). With exFAT there is a further problem that some Linux systems do not timestamp the files correctly when Daylight Saving Time is in effect. NTFS works reliably, but then the card cannot be used in digital cameras, only computers. (p. 19) Ethical issues: I wrote, "some people are likely to be put off by a picture of anything, no matter how beautiful, if it is astronomically false or impossible, such as a combined image of two separate nebulae or an eclipsed sun in front of clouds." The latest thing is even stranger — motion pictures with fake and unrealistic movement in them, made from still pictures. I've just seen a motion picture of a well-known nebula in which the gas clouds are swirling around (not in any physically realistic way) and, some of the faint stars are running around in circles, as if something were chasing them. Very disconcerting, especially since people are going to see it and think the motion is real. (p. 25) dcraw: See note to p. 228. (p. 51) Limiting Light Emission from the Camera: The Nikon D5500 has a touch screen, which can and should be disabled from the menu settings before you put a red cover over the screen. If you can't disable the touch screen, you can still use a red cover, but it may prevent the touch screen from working. It is prudent to make sure your camera does not have essential functions that are only available from the touch screen. (p. 57) Magnified Preview on the Screen: If you have trouble seeing stars, try changing the focus, since out-of-focus stars disappear. Also make sure the exposure is set to B (Bulb) and the ISO is set to a high value (possibly higher than you will use to take the actual picture). Finally, magnify the screen image; on some cameras, stars are barely visible when magnification is turned off. (p. 58) Bahtinov mask: I have found that a Bahtinov mask works very well with live view focusing at high magnification. Each star image is surrounded by six diffraction spots. When they are positioned symmetrically (the middle one on each side halfway between the other two on each side), focus is correct. It is easy to detect very slight focus changes, such as those caused by tightening a focus lock. (p. 82) Dark frames: The eyepiece cap is more important than I first realized; light can leak into the camera through the eyepiece, so now I always use the eyepiece cap not only when taking dark frames but also when taking the deep-sky images themselves. This is all the more important now that we often have a computer emitting small amounts of light in the vicinity of the camera. If you have trouble with the rubber Canon eyepiece cap that is supplied on the camera strap, get a Nikon DK-5 eyepiece cap, which is rigid plastic and slightly too big, and line it with black vinyl tape. When taking dark frames indoors, particularly for sensor testing, note also that your lens cap may not be perfectly opaque to infrared light, and light can even leak in through the lens mount. It is best to take dark frames in the dark. (p. 85) Acquiring flat fields: There are two problems with using the daytime sky as the light source. One is that the color is so bluish that one risks overexposing the blue pixels while inadequately exposing the others. The other is that when first set up in the daytime, the telescope is not focused on infinity, unless you can focus it on the moon or a very distant terrestrial object. Ten years ago, it was common to decolorize the flats by binning (averaging) pixels 2×2. We now know that one of the important functions of flats is to compensate for differences between individual pixels, not just dust motes and vignetting, so this is no longer recommended. If you use an artificial light source, you need something that emits light equally in all directions that can enter the camera, including not only the field of view, but also light rays that could cause reflections. I had disappointing experiences with a small light box that was not equally well diffused at all wavelengths; I got shadows and irregularities in deep red. Currently I'm using an LED-illuminated, USB-powered artist's light box as a light source for flats. If you use an 8-inch (20-cm) telescope, bear in mind that some "A4 size" light boxes are slightly more than 20 cm wide, and some are slightly less; you'll need one that is bigger than the telescope objective, of course. Also look at it closely and make sure its brightness does not fall off sharply when you're not viewing it from a perfectly perpendicular direction. (pp. 86-87) Bias frames: I have heard unconfirmed reports that some DSLRs (not Canon or Nikon) have different bias levels in M (Manual) mode than in B (Bulb) mode. You can find out by taking a dark frame in M mode and in B mode and comparing them in software that allows you to read out the pixel levels (see later chapters). If your camera has different bias levels in M than in B, this should not affect calibration from lights, darks, flats, and flat darks, but it may cause problems if you use a method that relies on bias frames or if your software treats the flat darks as bias frames. (p. 108) Lens quality: The lens test web site that I rely on the most is opticallimits.com, formerly photozone.de. Another good one is www.lenstip.com. Their plots are not MTF curves, but rather the resolution at which 50% MTF is achieved, plotted versus f-stop. You want the center and edge readings (red and blue dots on the graph) to stay close together so that star images will be round. Most lenses nowadays are sharpest wide open or nearly so, and resolution falls off at higher f-numbers; that is normal. The publishers of this site are harsh critics of lens quality (just like us), and they share my impression that many of the best lenses are made by Sigma. Another treasure trove of lens information is the blog at www.lensrentals.com, which contains dozens of highly technical (and sometimes amusing) articles about lenses and lens testing. They test lenses for MTF, and they, too, find that the newest Sigma lenses are second to none. The newest lenses are very sharp, very fast (f/2 or even f/1.4), and rather expensive (think $1000 per lens). I have not yet used any of these newest-generation lenses (Sigma Art series, Zeiss Otus and Milvus, and their competitors from Canon and Nikon), but the test results are impressive, and $1000 for a good lens is not excessive when you consider what lenses cost in 1970 and factor in inflation. (p. 152) Polar scopes: I found that when I tilted my head to look through my polar scope, I often misjudged the orientation of the reticle. The cure is to use the altitude adjustment of the mount to establish exactly what direction is vertical. Center Polaris, then use the altitude knob to move it to the very bottom or very top of the circle, and then go from there, using software or the chart on p. 153 to find out where to place Polaris. (p. 158) A futile quest: See note to p. 160. (p. 158) Noises from mounts: One aspect of mount performance that I didn't mention is noise. Computerized mounts with servo or stepper motors can make strange noises and move in irregular jerks when slewing. Noises mean nothing unless there is actually a problem with tracking performance and the noise is correlated with it. Some mounts squeal, hum, buzz, creak, and alternately fall completely silent at unpredictable times while tracking. As for irregular jerks, when the mount slews from one place to another, an algorithm manages the motor acceleration, and sometimes the criterion for using a higher speed is fulfilled for only a fraction of a second. As long as the telescope ends up pointed correctly, the noises it made getting there are of no significance. (p. 160, bottom) Unguided subs: The length of unguided exposure that you can make with a particular mount is not inversely proportional to focal length. For example, if you can go 2 minutes with a 100-mm lens, that doesn't mean you can necessarily go 1 minute with a 200-mm lens. The reason is that periodic error is periodic. It is an oscillation, not a steady drift. As you expose longer, the error doesn't keep increasing; it reverses itself and the tracking swings back and forth around the correct position. The error in a 2-minute exposure is anywhere from 1 to 2 times that of a 1-minute exposure, depending on the waveform. At shorter focal lengths, the error can be completely invisible no matter how long you expose, and then, at a particular focal length, it suddenly starts to make a difference even in short exposures. The proportionality does work in the opposite direction. If you can expose 1 minute with a 200-mm lens, then you can expose at least 2 minutes with a 100-mm lens, possibly more. (p. 160, bottom) Unguided subs, a further note: Once you get periodic error down to a certain level, the length of your unguided subs is likely to be limited by small errors in polar alignment whose effect is different in different parts of the sky, leading to widely varying results. To keep drift down to 1 arc-second per minute of time (which is reasonable if you want to do 2- or 3-minute subs with a long telephoto lens), in the worst case you have to polar-align to within 4 arc-minutes, which is better than you can do with a polar scope or even Celestron's ASPA routine. At that point, drift alignment with a guidescope and guide camera comes to your rescue — but if you can do that, you might as well just autoguide! Devices such as the Polemaster (a polar alignment camera) are also very handy, but you have to bring along your computer, at least for polar alignment. (p. 161) Backlash: It is important to distinguish worm backlash (which the telescope can wobble across) from total backlash (which causes a delay when you slew in one direction and then the other). Some newer mounts reduce worm backlash practically to zero by spring-loading or magnetically loading the worm. Celestron tells me there can easily be 60 arc-seconds of backlash in the gearbox (not the worm gear); this is normal, and no adjustment of the worm gear will affect it. Some mounts should be deliberately unbalanced (east-heavy) for better tracking, and some should not. Celestron recommends unbalancing the mount to the point that it might actually move when brakes are released. Don't do this with mounts that have spring-loaded or magnetically loaded worms, or whose instruction manuals do not recommend it. Celestron's specification for total backlash on a mid-sized German equatorial mount is 60 to 180 arc-seconds. Zero backlash is not the goal. (p. 165) Communication with the mount: Regarding INDI see second note to p. 189. You may be wondering why so many telescope mounts still use RS-232 serial ports instead of USB. There are two reasons. First, RS-232 signals are much better at traveling over long cables through electrically noisy environments. Second, unlike USB, the RS-232 standard does not require a device driver. Mounts tend to last longer than computers and may be used with computers that were not foreseen when the mount was designed. If the interface is RS-232, then instead of needing a device driver for the mount, the unforeseen new computer merely needs to emulate the old RS-232 standard. (p. 166) When autoguiding with a color camera, bin the pixels 2×2 if possible, to eliminate the Bayer matrix. (p. 169) Choosing a Guide Star: Strange things can happen if your guide star is a double star and you don't realize it. If your autoguider seems to be jumping back and forth or just not acting normal, try a different star. (p. 172) Interpreting Guiding Graphs: Yet another cause of sudden jerks is electrical — a dew heater that turns on and off with a thermostat, causing a fluctuation in the voltage. You may be unaware of the thermostat action. This is a good reason to power the mount from a different battery than the dew heaters. (p. 173) Alternation, especially if very rapid, can also mean that the calibration is incorrect or absent; that is, the autoguider doesn't know which way and how far it is actually moving the telescope. Another autoguiding problem is runaway, when the autoguider quickly makes corrections in the wrong direction and runs away from the star with exponentially increasing speed. That can happen if you have done a meridian flip and the autoguider doesn't know about it. More generally, it means the calibration is backward (the movements are in the opposite direction than the autoguider intends). (p. 176) How Roundness is Measured: PixInsight has moved SubframeSelector from Scripts to Process, ImageInspection, and it runs much faster. If all you want to know is eccentricity, and FWHM in pixels, then you need not tell it the scale of the image or the gain of the camera. (pp. 185-6) Alternative to lamp cord: The ideal power cable would be the same size (of wire and insulation) as lamp cord, but more flexible thanks to silicone insulation (rather than PVC) and wires made of many very thin strands. I've found a supplier of such wire, BNTECHGO, in China, and their product is available on Amazon at this link. Do not confuse it with other BNTECHGO products, nor with red and black "zip cord" from other sources. (p. 189) Linux is better supported with every passing day: For greater long-term stability, many amateurs (including me) are migrating to Linux for telescope and camera control (a process I have nicknamed "defenestration"), and the available software is getting better rapidly. Open PHD Guiding (PHD2), FireCapture (for video), and KSTARS (for star maps), and especially Ekos (for camera and telescope control) have free Linux versions. PixInsight supports Linux and macOS as well as Windows. (p. 189) Telescope controller need not be a laptop: If you're going to have a dedicated computer for your telescope, autoguider, and camera, it need not be a laptop. The latest trend is to use a very small computer that rides on the telescope and is accessed remotely. The small computer may be a Raspberry Pi or an Intel Compute Stick, but ready-to-use solutions are becoming commercially available. One is the Stellar Mate, much cheaper than a laptop. The computer is small enough to ride on the telescope, runs on 5 volts, comes pre-configured with suitable software, and totally frees you from worrying about whether your main computer will remain compatible with your equipment-control software. Stellar Mate runs as an INDI server, which interfaces with your equipment and enables you to control it with Ekos or other software from the computer you are sitting at. (p. 202) PixInsight dark frame optimization should not be used if the sensor has appreciable amp glow. It assumes the dark frames are genuinely dark. (p. 228) DSLR raw files: dcraw has been superseded by LibRaw, a new open-source raw file decoder, and PixInsight has made the switch. A note here has been deleted. Further experimentation validates the method given in the book but not the simplification that was briefly described here. (p. 281, p. 298) www.sensorgen.info is apparently defunct. (p. 287) Amplifier Glow (Electroluminescence): Yet another source of a pesky glow of this kind is infrared emission from circuitry in an autofocus lens. I have heard of this happening only with cameras that have had the IR-blocking filter removed and not replaced with another filter that blocks deep infrared. The cure is to remove electric power from the lens by covering its contacts with tape. Of course, if you have this problem, it will occur only with one or a few lenses that contain electronics, not with telescopes. (p. 295-297, 302) Dynamic range as reported by PhotonsToPhotos is not the same as reported by DxOmark (even when derived from DxOmark data). PhotonsToPhotos uses a different SNR limit and produces values that are about 2.5 stops lower. 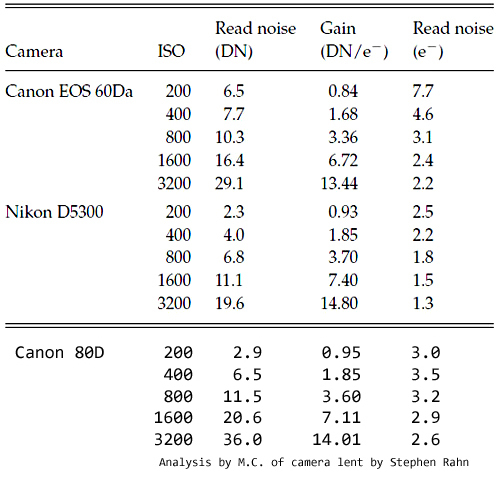 (p. 304) Here is Table 16.1 with a third-generation Canon added, the 200D. I don't plan to keep adding to the table indefinitely, but this step in technological progress is noteworthy. The Canon 200D is ISOless but seems to have more read noise than the Nikon D5300. However, it has become evident that the Nikon performs considerable noise reduction by preprocessing the image file in the camera, while Canon raw images are "rawer." Thus, the numbers are not directly comparable. (p. 307) Filter Modification: Modified DSLRs can be rented — see note to p. 13. Unfortunately, clear weather cannot be prearranged to coincide with a rental. (p. 308) Filter modification can bring out chromatic aberration in lenses. This point needs to be emphasized. With my Nikon 180/2.8 ED IF (non-AF) lens on a modified camera, the stars have bright red haloes. With some other lenses, it is necessary to "focus out" the red haloes, and the star images are not quite as compact as with an unmodified camera. (p. 309) Benefit from filter modification: Here is a more dramatic example than the one shown on p. 309 and on the back cover. These are the nebulae NGC 7822 (top) and Cederblad 214 (bottom) (conflated with NGC 7822 in some older catalogues), very thin red emission nebulae. Both are stacks of ten 2-minute exposures, taken in town (not at a dark-sky site), with the same 180-mm lens at f/4. Because the sensors had different size pixels, the scale does not match exactly. Left: Nikon D5300, unmodified; right: Canon 60Da, which comes from the factory with a special filter for greater hydrogen-alpha sensitivity. (p. 320) Aladin: Now see also worldwidetelescope.org, a joint project of Microsoft and the American Astronomical Society. (p. 324 Fig. 18.5) Incorrectly reported orientation in Astrometry.net: This problem seems to have been corrected in the version of the software that is now on the nova.astrometry.net server, but I still advise caution. It has not been corrected in the versions that are available for you to run locally. The problem apparently arises from some ambiguities about the orientation of FITS files, and other files are converted into FITS for processing. What you really want, of course, is to identify objects and determine the arc-seconds per pixel, and those always come out correct. (p. 324) Brief problem with astrometry.net web site: In November 2018, the web site was temporarily unavailable, and because it is considered a beta test, it may be unavailable again in the future. An alternative is to run the software locally (see below). Running Astrometry.net locally under Linux: The following is how I got it working under Linux Mint; the same procedure works under Ubuntu, Debian, and Windows Subsystem for Linux (Bash on Windows). Here --downsample 2 means to downsample the image before solving (this will not affect pixel size calculations; omit it if the image is small, and change it to 4 if the image is large). The parameters-L 0.1 -H 180 tell the software the field is between 0.1 and 180 degrees wide; you can save time by giving a more precise guess. The other files are disposable. Most of them are FITS format data files but do not contain viewable images. See also /etc/astrometry.cfg for configuration settings that you can change, and use the command man solve-field for very concise instructions. Note that the Debian-packaged version does not identify NGC or Messier objects, only bright stars. That is because of copyright problems with the NGC catalogue that is bundled into Astrometry.net — the Debian repository system does not consider it legal to distribute. Simply adding the files does not help; the software compiled for Debian does not use them. Instead, you can go to https://github.com/dstndstn/astrometry.net, get the source code, and build the software yourself, or use one of several Windows plate solvers that use Cygwin and include the full set of files. I hope to add more information about this. Back cover: See note to p. 309. Copyright 2019 Michael A. Covington. Caching in search engines is explicitly permitted. Please link to this page rather than reproducing copies of it. This page is not in any way connected with or endorsed by any photographic or software manufacturer. Many of the product names that appear on this page are registered trademarks of their respective owners.